File conversion solves the problem of format incompatibility and allows using different information wider, changing its format from graphic to text or web file type. For instance, if to convert HTML to PDF you can save web-pages locally in a format convenient for viewing, printing or sharing. Most of HTML converters are OS-oriented, means that you can use them locally on a personal computer. 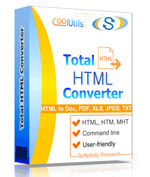 The conversion package that will run on a web-server is Total HTML Converter X. It can be handled via a command line or ActiveX technology that is used for launching applications in web browsers such as Internet Explorer or Mozilla. ConvertToStream Method. You can stream resulting PDF straight to the user. Using Total HTML ConverterX on a web-server you can make its functionality available on your own web-services that can be used by clients. In such a way your service users will be able to convert HTML files with no need to install a converter on their PC. All you need is do download the installation kit and activate a license for use. How to call HTML ConverterX ActiveX from ColdFusion on Windows?